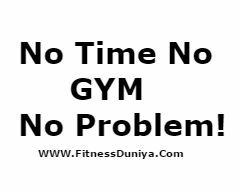 Nowadays a thought has become enough, that if you not doing gym then how will you stay fit?Because Life is very busy, there are lots of things to say,many excuses, this means No Time No Gym! But we do not believe that only going to the gym will make you fit and there are no other options. If you want from your heart, you can always fit yourself, without any excuse. And these are not very difficult things, difficult we make it in our thinking in our mind. If we change some little things in our lifestyle and make our habit then believe that nobody can stop you from being fit. The biggest obstacle in life is we give up hope and everything is lost. So let us now tell you some very easy things that will keep your body healthy and active. Change your lifestyle - Changing the lifestyle is meant to be active,come out from your room your comfort zone, meet the people. Many people spend their lives in a limited area, and this is a very big reason to make people sick, if they are ill with mind and soul then how will they stay healthy? Change your eating habits - Food is directly related to our health, so as to eat it will be made. It would be better to leave the habit of eating bad unhealthy food, such as fast food, oily food, late night dinner etc. These habits add fat to our body and ruin our body. Eat good food such as vegetables, high fiber foods, dairy products, dry fruits etc. Early to bed early to rise - From childhood we have come to listen early to bed early to rise, but how many people follow it seriously? Today, the Late Night Life style has become a part of everyone's life,like late night parties,club life,watching tv etc and these all things destroy our health. So friends early to bed early to rise and get healthy life. Be happy - Be happy, do not think negative, do good talks with good people. The more negative you think, the more annoying and the same will be a negative effect on health. If you are more worried then there will be weight loss, muscles loss. Walk more - Take at least 15 to 25 minutes fast walk daily whenever you find time.This will keep your body fit and reduce extra fat from your body. Walking is very important for heart patients, diabetic patients. Skip elevator use stairs - Very effective and everyone can do this, leave the elevator, use the stairs, make a big difference, do not only lose weight your stamina will also increase. There will be some people who have flat or office on the very top floor, then use the stairs as far as then use elevator and raise it gradually. Spend some quality time with your near and dears - Spend some good times with your special friends or family members. This will give positive thoughts to your mind and you will feel good. Negative feelings come in our thoughts live constantly alone, whose effect on our entire body, both phisically and mentally. All these things may seem to be very natural or unusable, but remember small things, smallest efforts bring big changes.